Genuine OEM Samsung Toner Cartridge, Magenta, 1,000 page yield. Samsung part number: CLT-M404S, CLT-M404S/XAA, SU238A. Color Laser Toner Cartridge compatible with Samsung Xpress C430W, C480FW. Remanufactured Samsung Toner Cartridge, Magenta, 1,000 page yield. Replaces Samsung part number: CLT-M404S, CLT-M404S/XAA, SU238A. Color Laser Toner Cartridge compatible with Samsung Xpress C430W, C480FW. Remanufactured Samsung Toner Cartridge, Cyan, 1,000 page yield. Replaces Samsung part number: CLT-C404S, CLT-C404S/XAA, ST970A. Color Laser Toner Cartridge compatible with Samsung Xpress C430W, C480FW. Remanufactured Samsung Toner Cartridge, Yellow, 1,000 page yield. Replaces Samsung part number: CLT-Y404S, CLT-Y404S/XAA, SU448A. Color Laser Toner Cartridge compatible with Samsung Xpress C430W, C480FW. Remanufactured Samsung Toner Cartridge, Black, 1,500 page yield. 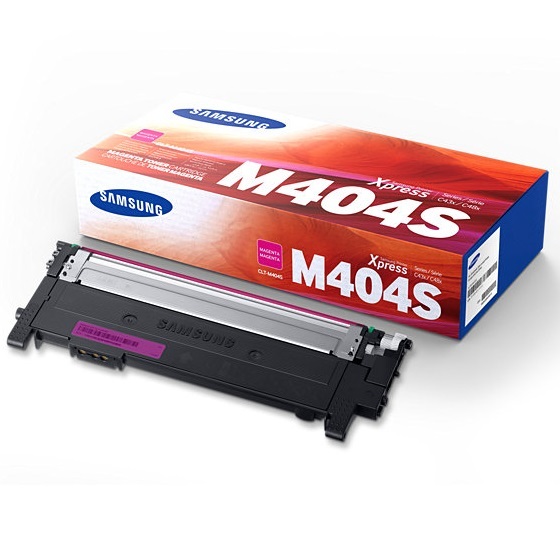 Replaces Samsung part number: CLT-K404S, CLT-K404S/XAA, SU104A. Laser Toner Cartridge compatible with Samsung Xpress C430W, C480FW.